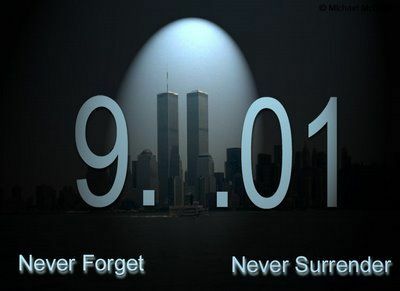 Today marks the 14th anniversary of that dark day, when Islamic jihadis killed 2,996 of our friends, neighbors, and loved ones. Three years ago, the USA Today is wondered if 9/11 is becoming just another day, similar to Pearl Harbor Day. Based on the limited coverage by some news outlets, it may be. People wonder why we should Remember the day in an overt fashion, unlike, say, Pearl Harbor day. Well, we defeated the Japanese within a few years. It was a different type of war. 9/11 was when we were attacked on our continent by people who will not stop anytime soon, an enemy that is not centralized by a nation, who spread according to their religious tenets. There’s also the long video The Falling Man. And 102 Minutes That Changed America. This entry was written by William Teach and posted on at 7:47 am and filed under 2996. Bookmark the permalink. Follow any comments here with the RSS feed for this post. On this solemn anniversary, let us bow our heads to offer our wholehearted congratulations and outright surrender to our Mohammedan brothers in Tehran. Why did we end up doing exactly what he wanted us to do? Bill Clinton knew about this in 1998. You’re an idiot. There is no other way of putting that. The idea that Bin Laden was trying to attack the US was part of the Presidential Daily Briefing (PDB). I would say that you can read the part dealing with Bin Laden at this link, but you won’t read the actual paper or be able to understand it. The PDB is non-specific and no one in the intelligence agency, the Bush Administration, or the 9/11 Commission ever claimed the PDB was specific enough to have stopped the attacks. Instead, efforts were continued to find out what was going on and to try and stop any attack. The 9/11 Commission notes that the idea that the attack fell into a void between domestic intelligence agencies and intelligence agencies that dealt with foreign issues. This was the famous “wall” erected by the Clinton administration. The bottom line is that in your zeal to be a partisan mouthpiece you reveal yourself to be a complete moron who lives in a fantasy world and to whom facts do not matter. Unfortunately, there will always be buttwipes like you who on this day of remembrance will try and make 9/11 political and blame others. You’re a sad little troll, john. What gitarcarver said x100, John. You’re a disgrace as a human being. Pirate's Cove is powered by Pure Neocon Pirate Evil. Oh, and WordPress 5.1.1. Delivered to you in 0.797 seconds.